Joaquin Phoenix was spotted on the set of Joker filming new scenes that take aim at the rich over. The plot of the movie is being kept under wraps, but we know that Phoenix's Clown Prince of Crime has a pretty big problem with Gotham City's more well-off population, as seen in previous set photot. One of the members of the villain's clown team can be seen holding a sign that says, "Kill the Rich" from the set this weekend ,while another signs says, "Stop Corporate Greed." In the earlier Joker set images, normal citizens and clowns had signs that had messages for the rich in Gotham City. While it's not clear what exactly will happen in the film just yet, it's safe to assume that it will have something to do with the city's elite. It's also been revealed that Joaquin Phoenix's Joker and gang robbed a church, which means that we could be seeing a Robin Hood type of situation. The villain may be more of an antihero in Todd Phillips' project. Joker takes place in the 1980s and focuses on a struggling stand-up comedian named Arthur Fleck. While Todd Phillips has been pretty quiet about the project, Joaquin Phoenix has revealed that the film is going to be a gritty character study, which sounds pretty unique and awesome. DC fans have seen the iconic villain a lot over the years from various movies, TV shows, and comics, but we've never gotten to go really deep to see what makes Joker tick. Hopefully, the lower budget project will deliver what motivates the villain. 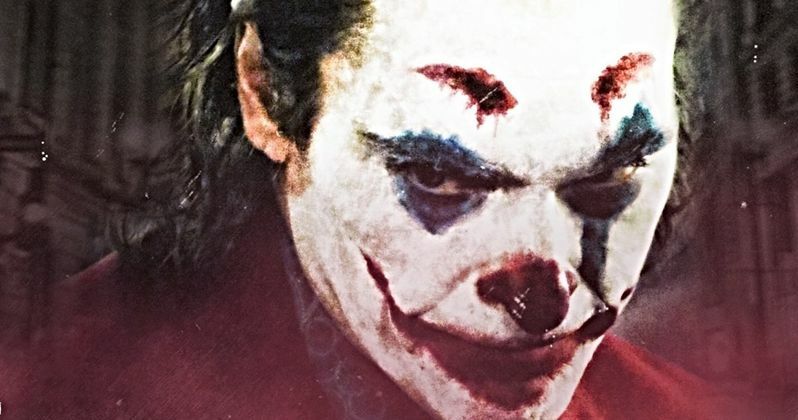 Joker is currently filming in New York City, and a ton of photos and videos have leaked from the set, showing off Joaquin Phoenix's take on the villain. A lot of the images have included Joker with a bunch of clowns, who are more than likely a part of his gang. But what is motivating them to go up against Gotham City's elite? The film is a year away from hitting theaters, so we won't find out for quite a while. Thomas Wayne will also be brought into the equation, so it will be interesting to see how everything fits together. Todd Phillips' Joker opens in theaters on October 4th, 2019 and it promises to show us a much different view on the Clown Prince of Crime. Phillips is directing the movie from a script he co-wrote with Scott Silver. The movie stars Joaquin Phoenix, Zazie Beetz, Bill Camp, Frances Conroy, Brett Cullen, Glenn Fleshler, Douglas Hodge, Marc Maron, Josh Pais, Shea Whigham, and Robert De Niro. While we wait for some more official information about Joker, you can check out the most recent set photos below, provided by Just Jared.